The cup-shaped flowers on tulips (Tulipa) may be confused with some other blooms, though tulips grow on single stems and have sword-shaped leaves, unlike most of the blooms that they resemble. 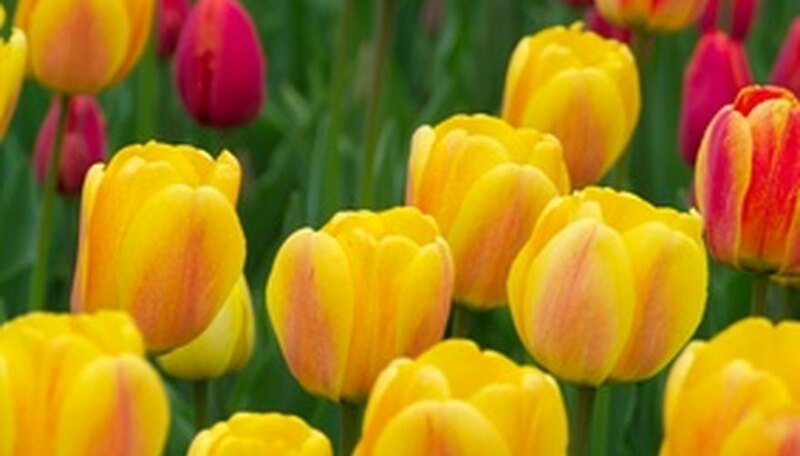 Tulips, which are grown from bulbs, usually bloom in spring and require some winter cold for best performance. Some flowers that look like tulips grow on trees or shrubs, though one is also a member of the Liliaceae family. The bellflower 'blue clips' cultivar (Campanula carpatica) has blue-violet cup shaped flowers that resemble tulips, though the plant itself does not look like a tulip plant. The blooms, which have petals that come to a point at the end (tulips are rounded at the top of the petal) sit among the dense foliage of this mounding perennial. Bellflower blooms appear in clusters between July and September. Often used as a border plant, bellflower is low-growing and spreads. It can reach about 12 inches tall. Hardy in U.S. Department of Agriculture Plant Hardiness Zones 3 to 8, bellflower may be planted in full sun in cooler climates to filtered sun or part shade in warmer climates. It requires moderate water. The crown imperial (Fritillaria imperiali) is a member of the Liliaceae family and bears some resemblance to the tulip, though the blooms hang upside down, unlike tulips, which open at the top. The crown imperial, which is considered an "old fashioned" flower, according to AllAboutFlowers.org, has a cup shaped bloom with wide petals that are pointed at the top. This plant grows from a bulb, like the tulip, and is available in orange, red or yellow. Crown imperial bulbs may be left in the ground in most climates, and are hardy in Zones 5 to 8. Bulbs should be planted in full sun to light shade and require regular water during growing season. Also called saucer magnolia or tulip tree, the Japanese magnolia (Magnolia soulangiana) produces fragrant, cup-shaped blooms in pink, white or red-purple. The flowers resemble tulips in shape, but can be up to 6 inches across. The plant blooms in spring. The plant itself is a deciduous tree that can grow to 25 feet and is hardy in Zones 5 to 9, but best planted where the risk of frost is minimal, as blooms may be burned. Japanese magnolias have coarse, dark green, oval leaves that average 6 inches in length. This tree thrives in part shade to full sun and requires moist soil.